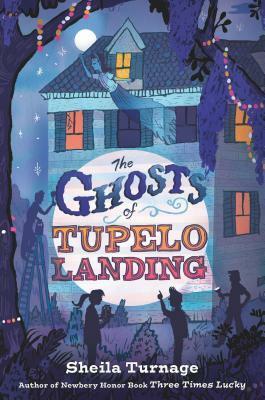 Title: The Ghosts of Tupelo Landing, 352 pp. Mo LoBeau and her partner Dale are back and their Desperado Detective Agency is taking on their toughest challenge yet: they need to interview a ghost and save the worn-out old Tupelo Inn for Miss Lana and Grandmother Miss Lacy. They have a lot of motivation: not only will the whole town suffer if someone nasty ends up with the Inn, Mo and Dale need that interview to pass their 6th grade History class. All our old friends from Three Times Lucky are back, and a few new ones. I have to get something off my chest right from the start: I read (and reviewed a couple of weeks ago) another book with a ghost, and I dinged it pretty hard for having a ghost, taken at face value (i.e., presented as a real ghost, seen and believed in by a number of people and no other explanation available). Well, The Ghosts of Tupelo Landing has just that sort of ghost, and it didn't bother me (very much--I'm a little too rationalistic to be completely happy with it). This has led me to think a lot about ghosts and how they can or can't fit into stories. Two things about this book make the ghost work for me: for one, it's set in the South. That's a place for ghosts, almost as good as ancient castles and baronial piles on the other side of the Atlantic. And, maybe more important, the whole book is just a shade (uh, no pun intended!) removed from realism in any case--there's a certain over-the-top fun attitude that allows me to accept the unbelievable. So, the ghost dealt with, did I like the story? You bet I did! Almost as much as I liked Three Times Lucky. 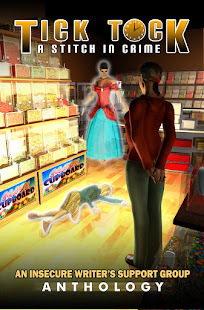 The story is fun, the narrator (Mo herself) is witty and as insightful as a 6th grader should be, and the plot is (once ghosts are accepted) logical enough to be convincing. It zipped along, a fast read that pulled me in and kept me turning pages. It also had a line that for some reason just doubled me up with giggles, when Miss Lana advises, with regard to ghosts, that Mo and Dale just "live and let. . . whatever." As with Three Times Lucky, themes of family and familial love run strong in the book, and Mo is gradually settling into an acceptance of the family she has, which really works pretty well, as families go. Highly recommended, but read the books in order, or you'll spoil the surprises in the first book. Full Disclosure: I borrowed The Ghosts of Tupelo Landing from my library, and received nothing from the writer or publisher in exchange for my honest review. The opinions expressed are my own and those of no one else. I am disclosing this in accordance with the Federal Trade Commission's 16 CFR, Part 255: "Guides Concerning the Use of Endorsements and Testimonials in Advertising." Do! But start with Three Times Lucky, which is not only the first in the series, but probably even better! It definitely sounds like fun :) Love the premise of the story about interviewing ghosts! Looking forward to reading this series. 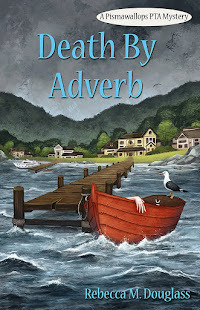 Thanks for sharing this on Kidlit Bloghop. Yes--interviewing a ghost definitely involves the kind of creative problem-solving I admire (and wrote into the Ninja Librarian books). I think Turnage's books also beautifully model the humorous treatment of serious matters. There are children in these books dealing with real issues, but the funny turn is never far off. Growing up I was always a fan of mysteries even the ones with crazy ghost mysteries like in Scooby-Doo. This sounds like a book I need to share with my daughter. Thank you! :D Its great fun--I'm sure she'll enjoy it! Ice Cream party at the Ninja Librarian's blog! A to Z Theme Reveal Blog Hop! Flash Fiction Friday: ". . . And His Dog"
Friday Challenge: Ten ways of looking at. . . It's Read an eBook Week 2014!